Here in the Chicagoland area we have had our annual few warm days in early spring. I do love these days I only wish they’d stay longer. As I type there are ice balls bouncing off of our picnic table in the backyard. Sigh. Well during those couple of warm days I got to feeling like I’m coming out of the winter hibernation finally and felt like having a nice light dinner. In our home we are big fans of the show Chopped. I think this is because ever since being a young girl I remember experimenting with food. My very first food I cooked, aside from toast, was french fries. I remember going through my Moms seasonings and shaking random seasonings into the hot oil with the fries. This was exciting for me. My Sister and I were being babysat by my Aunt so I felt lucky being able to cook with very little help. While her and my sister did their hair and make up I cooked. The fries turned out great from what I remember. Ever since then I have enjoyed crafting food. 😉 Well lets get back to this light dinner mood I was in.. Winter is full of oven cooking, hearty meals and comfort foods and to me summer is all about light meals and BBQ’s. So I decided to make mini tacos. I wanted something different tho. I wanted a summery twist. 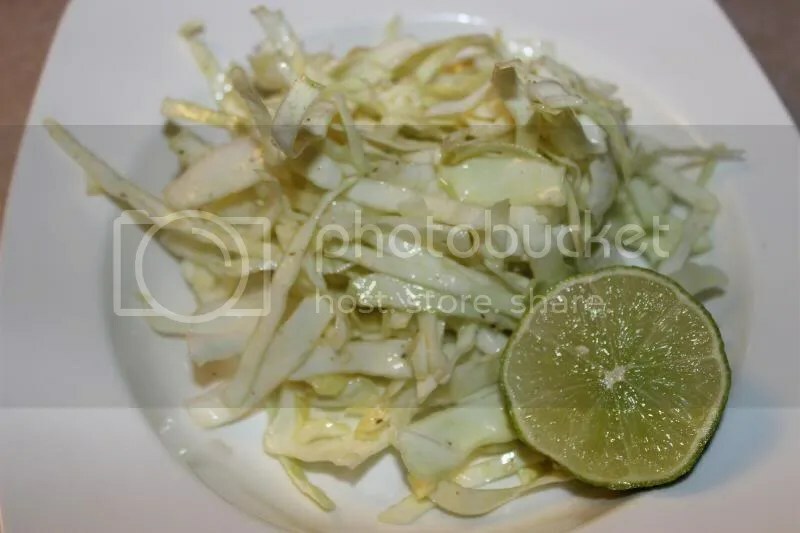 So I went in the fridge and pulled out the cabbage, and limes and thought hmm, I can turn this into something awesome. In a large bowl whisk together the olive oil, juice from the limes, celery salt, pepper flakes and cracked pepper. While this sits for a few allowing the juices to absorb flavor from the seasoning toast the sesame seeds. The more you toast the nuttier the flavor. For this slaw I like them very lightly toasted. You can also choose to leave the seeds out. Once toasted add them to the dressing and whisk. Add the cabbage to the bowl and using tongs toss until well coated.